The Agent Breakdown dashlet provides a view of accumulated performance data, broken down into different Agents or Agent Groups. This information helps to isolate performance issues at the Agent level. Each line of the table represents timing information from an Agent. The pie chart in the bottom part of the dashlet displays the data from the table column that is used for sorting. To select a column, click the column header. The pie chart is only available for columns that contain timing data. Flat: Every line in the table represents one Agent and its timing values. This is the default. By Agent Group: The Agent Groups are listed in the table, and Agents are grouped under their Agent Group. An Agent Group row shows the accumulated timing data for the whole Agent Group. When the Agent Group is collapsed, the pie chart represents the totals for the Agent Group. When the Agent Group is expanded, the chart contains the data for every single Agent of the Agent Group. Exec: Execution time spent in the target application of the Agent. 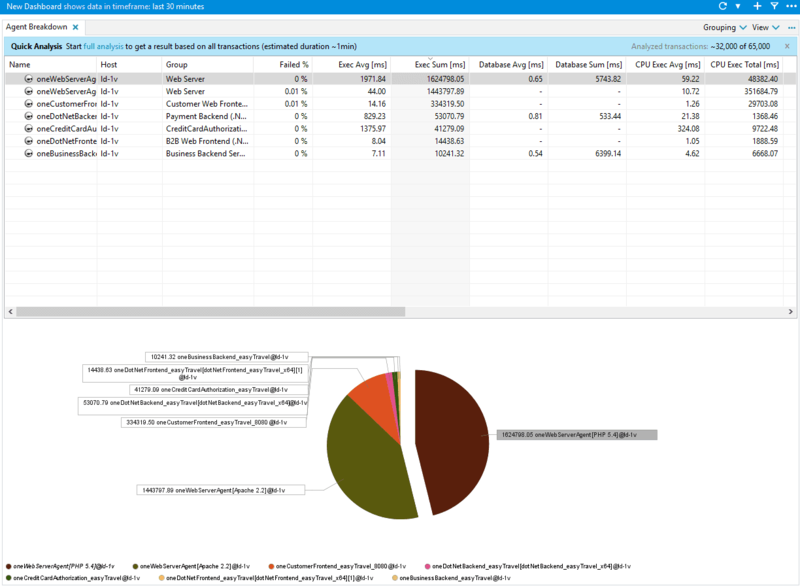 Database: Time spent executing SQL statements in the target application of the Agent . CPU Exec: CPU time spent in the target application of the Agent. Sync: Time spent in the target application waiting for monitors. Wait: Time spent in the target application waiting for other threads. Suspension: Time the target application of the Agent was suspended. A more detailed description of each column is available in the Columns tab of the Dashlet Properties dialog box. In this tab, you can select which columns to show or hide. To display the Dashlet Properties dialog box, right-click the dashlet and select Dashlet Properties from the context menu.